The Black-throated Weaver (or Bengal Weaver) Ploceus benghalensis breeding male has a golden-yellow forehead and crown, dark brown upperparts and face chocolate-brown, and grey-brown throat. Some males have a white chin and throat and may also have a white face. The breast is dark brown, and the belly to undertail-coverts are creamy white. The male in non-breeding plumage has a blackish (instead of yellow) crown, a yellowish supercilium, a dark line through eye, and black breast-band is variable, often restricted to patches at each side. The female is brownish above with a clear yellow supercilium, creamy white underparts but the breast may have a dark band, or speckled band, or dark patches at each side. The juvenile resembles the female, but has a broad white supercilium. The Black-throated Weaver occurs in eastern Pakistan (in the Indus floodplain), northern India (mainly in the Ganges floodplain from Punjab east to West Bengal and Assam) and southern Nepal to Bangladesh. There are also scattered records in peninsular India (see map below, based on Handbook of the Birds of the World, Vol. 15). No subspecies are recognised. The Black-throated Weaver inhabits lowland grassy areas near water, with tall standing grass and reeds, especially in areas with periodic flooding. The Black-throated Weaver feeds mainly on seeds, including those of grasses, rice, wheat, millet and sorghum. Nestlings are fed mainly with insects, especially grasshoppers, and also caterpillars, beetles, spiders, and small snails. This species is gregarious, foraging in flocks, and often foraging and roosting with other species. The Black-throated Weaver is polygynous. It nests singly or in scattered colonies of 4 or 5 nests, and sometimes in larger colonies. 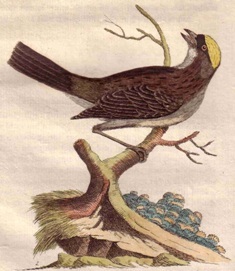 The male courts females with quivering wings, and bows downwards to expose the yellow crown. The nest is retort-shaped with an entrance tunnel of 6-30 cm length. 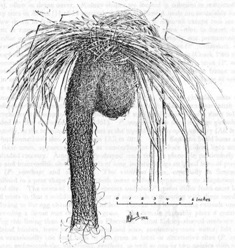 The nest is woven by the male from strips of grass or reed blades. It is suspended 1-2 m above the ground from grasses or attached to reeds or bulrushes, and rarely in trees. At an early stage of building (the "helmet" stage), the inner rim is plastered with cow dung or human faeces, and bright yellow flowers. If a female accepts a nest structure, it is then completed, and no further decorations are added. A male may have up to 4 nests at one time. The clutch is usually 3 eggs which are white and unmarked. The female incubates and feeds the chicks, with the male contributing food during the final five days. Nests may be destroyed by grazing cattle, and by people harvesting reeds. Intraspecific brood parasitism probably occurs as clutches of around 6 eggs have been found. 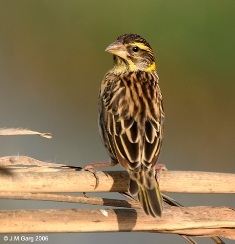 There are no PHOWN records for the Black-throated Weaver yet (see PHOWN summary). Check deserted nests as well as they may be used for roosting and breeding by the Indian Silverbill Euodice malabarica, and also by the long-tailed tree mouse Vandeleuria oleracea. Submit any weaver nest records to PHOWN (PHOtos of Weaver Nests) via the Virtual Museum upload site.